Consul General Claro S. Cristobal expresses appreciation to the women achievers in New York during the celebration of the International Women’s Day on 8 March 2019 at the Philippine Center. (From L-R) Atty. Elizabeth Cueva, Major Jessica Alina Persad, United Nations Under-Secretary-General Heidi Mendoza, Ms. Erin Robles and Atty. Connie Montoya. New York - Internationally respected auditor Under-Secretary-General Heidi Mendoza of the Internal Oversight Services of the United Nations, ranking female officer of the Connecticut Air National Guard Major Jessica Alina Persad, and food influencer and blogger Erin Robles sharedstories about their journeys in their respective fields with the Filipino-American community in New York during the celebration of International Women’s Day organized by the Philippine Consulate General on 8 March 2019 at the Kalayaan Hall of the Philippine Center in new York. Consul General Claro S. Cristobal commended the distinguished Filipino women for their courage and audacity and thanked them for sharing the experience oftheir challenges, struggles and success. USG Mendoza stated in her remarks that she spoke for many women, especially the unknown and unnamed women whose “only” achievement in life was to raise a family, women in government as public servants who are also part-time mothers, as well as women in the Philippines who stand for what they believe in. She also honored her own mother who chose to live an “insignificant” life so that her children could live significantly. Ms. Mendoza emphasized the women’s values of simplicity, humility, resilience, as well as the principles of accountability, responsibility, ethics, trust, and honesty in public service. Major Persad shared her 15 years of experience as a second-generation Filipino-American serving in the military, learning to protect and care for the vulnerable and those in need. Being a woman in the military, she stressed that she had to learn to find her voice and change her mindset by turning problematic situations into opportunities,steering her to leadership positions. She encouraged women to bravely take a seat and let their voices be heard. Erin Robles, torn between staying in New York and living in the comfort of her home in the Philippines, opted to pursue her dream in New York. Aninterior designer by profession, she started her Instagram account when it was fairly unknown, and used it to show photos of food depicting Filipino traditional celebrations.Her followers eventually numbered in the tens of thousands. She stated that the social media platform opened many opportunities to a 27-year old Filipina living alone in New Yorkand made her thrive in the profession that she loves. Ms. Robles encouraged Filipino-Americans to overcome feelingsof inferiority and be proud and own their passion, as she did, notwithstanding being the “youngest, female and Asian” in many of her work situations. Atty. Elizabeth Cueva and Atty. Connie Montoya, two women achievers in the field of immigration and law and volunteers in the Filipino-American community, applauded the journey and insights of the resources speakers. Atty. Montoya recognized their dedication to duty, staunchness to identity, and courage. A vibrant discussion with the women and men in the audience followed the speeches of the three resource speakers. 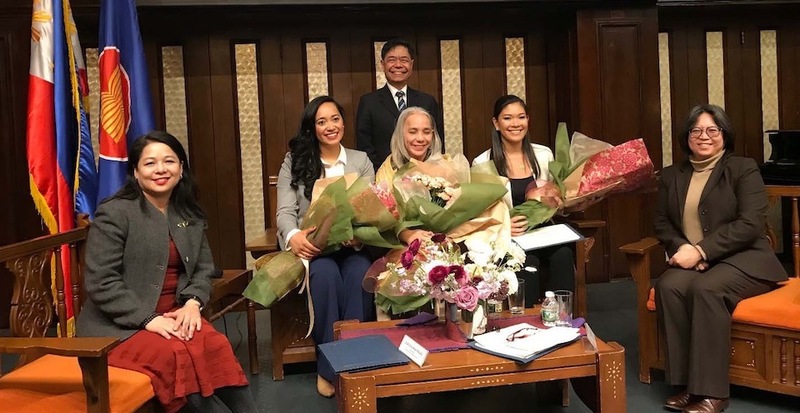 Now on its 5th year, “An Evening with the Distinguished Filipino Women” is an annual activity of the Philippine Consulate General in New York aimed at focusing the spotlight on Filipina women in the US Northeast who have gained recognition in the US.